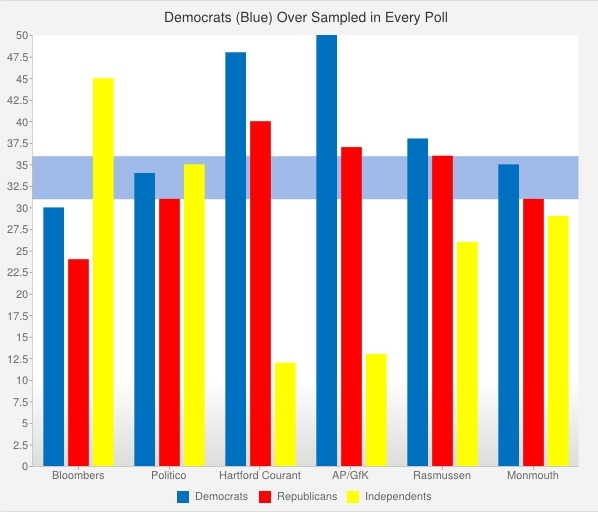 Bloomberg Releases Another Skewed Poll – +9 Democrats! (Corrected Results Shows Romney +3) | Virginia Right! Another day another skewed poll. But the good news is that after “Normalization” to correct the Democratic leaning of the poll Republican Mitt Romney actually has a 3 point lead, not a 6 point Obama advantage as the poll pretends to show. The complete analysis of this Bloomberg Poll is here. And the overall recap of all of the “Real Clear Politics” polls can be found here at Political Poll Check where the average actually shows Romney up by 6 (down from his previous 7 point advantage). ← Normalized Polls Show Romney up by 7 Points!